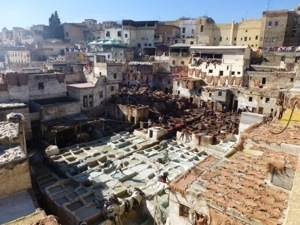 Fes is divided into three parts – the old medina, New Fes and Ville Nouvelle which is the more modern part with wide boulevards and modern hotels. It appears that every city in Morocco has a Mohamed V Boulevard as well as one named Hassan II (both after previous kings). Our tour guide, Hakima took us to various parts of old Fes including the Royal Palace (there appears to be one of them in every city too), a picturesque lookout, a ceramic factory and then finally into the old medina. It is a labyrinth of narrow passageways filled with shops, houses, mosques, donkeys carrying loads and everything else one would find in a city. It is not hard to see how easy it would be to get lost and we saw many tourists consulting maps and lonely planet books trying to work their way out. 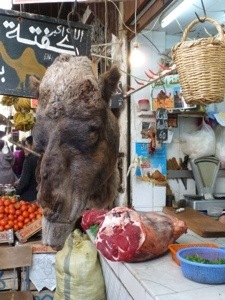 We walked through many shops including the butcher selling camel meat who had real camel heads displayed, the fruit and vegetable markets and what appeared to be thousands of tailors. We also visited the tannery where they prepare and colour animal hides. Before entering, you are given a handful of mint to hold up to your nose to sniff should the smell get too much and sniff it I did. It wasn’t the worst smell I’ve smelt but certainly not the best!! Lunch was in a converted house which is now a restaurant. Due to the world heritage listing of the medina, there are strict guidelines with regards what can be done in terms of development. This means there are very narrow buildings with many floors. Morocco seems to be a country of stairs. The waiters in the restaurants run up and down floors as the kitchens can sometimes be spread over several floors – one for barbequing meat, one for vegetables, one for tagine etc. Our afternoon was spent shopping – leather goods,carpets and scarves all of which involve sitting down to an obligatory glass of mint tea. We also visited the oldest university in the world and one of the 365 mosques in the medina. The next day we travelled South to Midelt which is located in the Middle Atlas Mountains and is a Berber village. We walked around the village and spent the night in a auberge which was very comfortable with our own room and bathroom. The next day we headed to the Sahara desert. We travelled to Merzouga to store our bags before mounting our camels and riding for 1 hour into the desert across the sand dunes. Our camp tonight was in tents with dinner cooked by our camel guides. It certainly was cold in the desert but we had sleeping bags and blankets. The stars were plentiful and we sat around a small fire whilst we listened to some arabic drumming. The next morning we awoke and climbed the sand dunes to watch the sun rise. 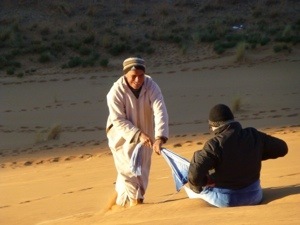 One of our guides then treated Andrew to a sand dune ride as he placed his cotton scarf on the edge of the dune and then dragged him down. Part way down it ripped but quick repairs (tying a knot) meant we could reach the bottom and back to camp. 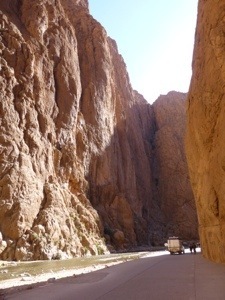 We then rode the camels back to where we had stored our bags and had breakfast before setting out for our next stop – Todra Gorge. The scenery along the way was desert landscape which is what it had been the previous days. We reached Todra Gorge towards sunset and we had to walk to our hotel via a bridge with our bags being brought over by the hotel staff. The next morning we went for a walk up the valley through the local village farms. It valley was full of palm trees and reminded us a bit of Palm Valley in Central Australia. We then proceeded to walk right into the gorge and past the natural spring that provides water to the village. Following lunch of berber pizza and salad at a local villagers house and the obligatory viewing of the carpet shop we returned to the hotel and then onto the hammam. A hammam is a traditional public sauna/bathhouse. After being issued with some black olive soap and an exfoliation glove you then strip down to your undies, are issued with a bucket and enter the sauna. It was a Sunday and very busy and finding floor space was tricky. We had paid to have someone scrub us down so after applying the soap we then had to lay on the floor whilst a local used the glove to exfoliate our skin. There is water everywhere as you are doused again and again. Following this you go into another room where you get a massage/stretch followed by more water after which you leave and get dressed again. Thank goodness we were warned to take a change of undies as the ones we wore were very wet. The whole experience takes about an hour. There were several fathers with their sons there and the locals often scrubbed each other rather than paying for the “professionals”. In terms of experiences, we are not sure we need to go to another hammam but can tick it off our bucket list. 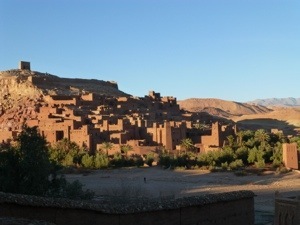 The next day we visited the movie capital of Morocco – Ouarazazate en route to Ait Benhaddou which has a Kasbah made famous and featured in films such as Gladiator and Kingdom of Heaven and more recently in Game of Thrones. Our host tonight was Mr Action who has been an extra in many of the films. 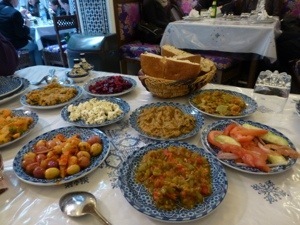 He and his sister showed us how to cook Tagine (2 hours) and couscous (3 hours). Thankfully they were only demonstrations and we didn’t have to wait all that time. We feel like we are right there with you. Sorry to have missed the hammam as I never mind rolling around in my undies on the floor. I will try to recreate the experience tonight on the floor of our room here in Puerto Escondido with Carol and a bucket of water. Couscous, if it takes that long to cook, they need to come up with an Uncle Ben’s 3 minute version because from the couscous that I’ve savoured, there is no way I’d sit around waiting for 3 hours to eat it. Glad that you are settling in with the experience, sand dune sledding and all. Keep enjoying every day and experience. You are having some great experiences, some we think we could miss, All fine here cooler last week 19mls rain Thursday, hot this week great for the wedding. Joe moved to Bendigo yesterday, quite excited Cate,s dad has to have chemo & radio therapy hard on Cate. last we went to a Rotary BBQ at Greg Whyke’s place. Enjoy Spain beware of the bulls. Love Dad & Mum.